If you have a hard time deciding between chocolate and fruit for dessert, then this is the fruit for you! 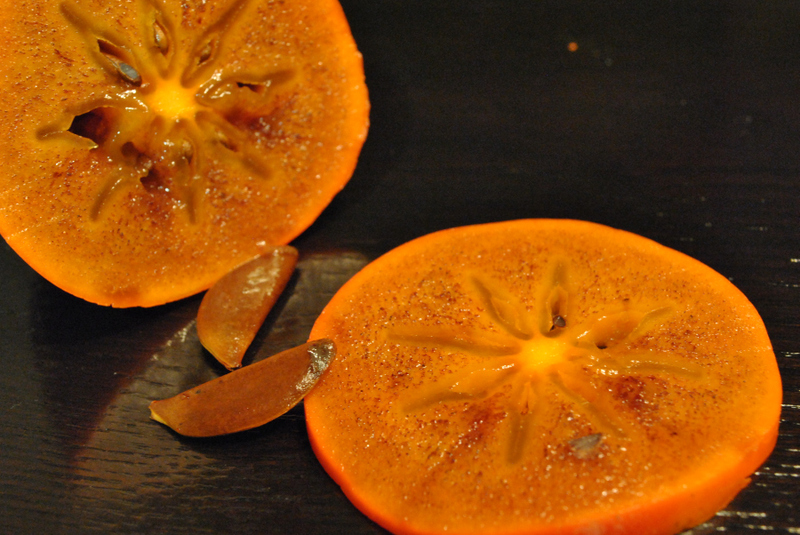 Bright beautiful orange skin, oblong shape, brown grainy looking flesh and relatively large flat seeds that make a pretty star anise design when cut. Citrusy – basically smells like an orange (for some reason that seems odd to me). Soft with nice juice, slightly grainy flesh. Not overly sweet, flavor reminds me of melons with a little spicy kick to it and a depth of cocoa that rounds out the flavor nicely. You have to be careful with these. If you eat them too soon you don’t get the chocolate flavor and it has a lingering, dry, that-banana-isn’t-quite-ripe, mouth feel (also known as astringency). 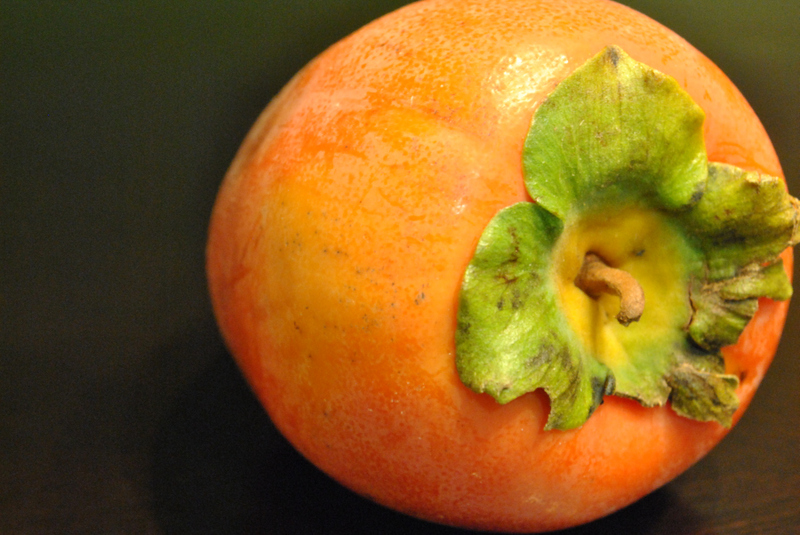 I tried this persimmon when it was still firm and the astringency was overwhelming. After reading up on it, it looks like sometimes they can be eaten while still firm, but sometimes not. It sounded like this would go away if I just waited a few days until it was slightly soft like an avocado. 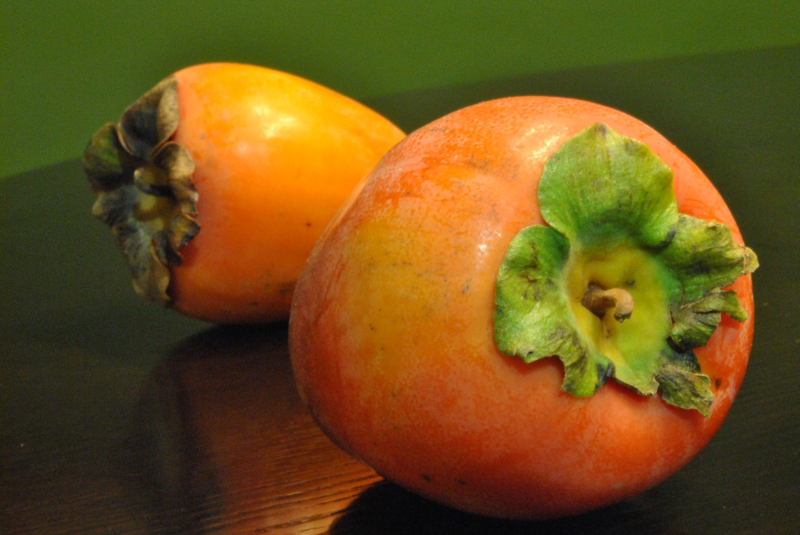 So I waited and – SHABAM – soft, luxurious, lovely, spicy chocolate persimmon flavor. Worth the wait! I mean, how often can you happily eat brown fruit and be pleased about it? Not often enough I say. I was wondering why this fruit is brown. (Weren’t you? You should be. 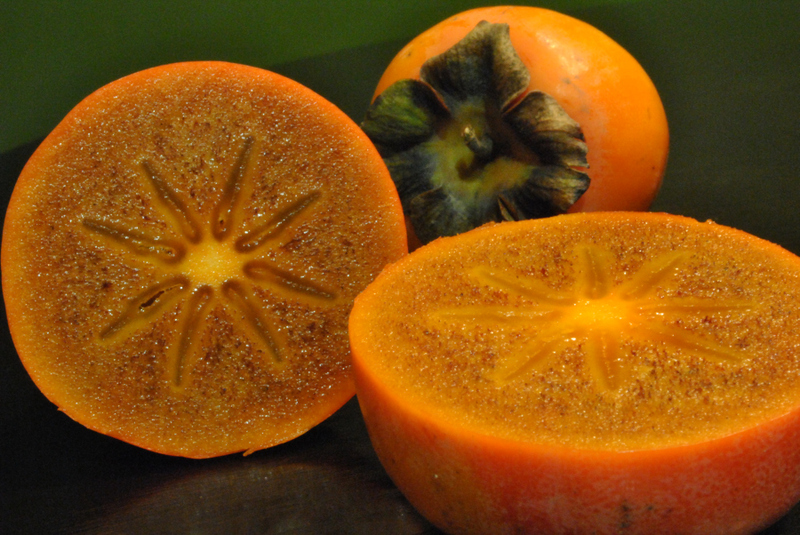 Brown fruit is not normal and not a sign of yumminess – generally. We have to look into these things. I can’t be responsible for some rogue hiker eating a brown berry and thinking it is fine because he or she vaguely remembered some delicious brown fleshed fruit on my site.) So anyway, David Karp of the LA Times provides this very helpful information, “…small quantities of alcohol exuded from the seeds cause the tannins in the flesh to clump together, turning the pulp brown, softening the astringency and developing a rich, distinctive flavor.” Phew! We are not going to die from this cocoa fruit. Carry on fruit eaters. Carry on.